Traffic on the Merritt Parkway was stopped for about 30 minutes after a car struck a moose. A young moose was killed on the Merritt Parkway today. A moose that was seen roaming around Darien and Stamford earlier this morning was struck by a car on the southbound side of the Merritt Parkway, near exit 37 in New Canaan, around 4 p.m. today. The roof of the car was crushed by the animal. The driver, a 51-year-old New Hampshire woman, was taken to Norwalk Hospital. Her condition is unknown at this time. The moose, a young bull weighing roughly 500 pounds, was "severely injured," according to a press release from the Department of Environmental Protection. It was put down by the DEP's Environmental Conservation Police. Traffic was halted at exit 37 southbound for roughly 30 minutes as emergency workers extricated the occupant from the vehicle. A front loader, police and ambulances were on the scene. The moose was removed from the side of the highway with the assistance of the state Department of Transportation. Traffic alerts were issued at that time that a moose was in the vicinity of the Merritt Parkway near the Easton/Fairfield town line and was headed south. The DEP was attempting to track and tranquilize the animal at the time, the release stated. This is the fourth such incident since January, with other accidents occurring in Barkhamsted, Canaan and Thompson. DEP estimates that Connecticut currently has a moose population of about 100, primarily in the northwestern corner of the state. 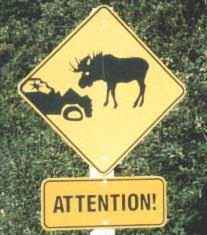 "Occasionally, an individual moose will venture outside of that area and is capable of covering around 20 miles per day," the release said, adding that a moose can weigh up to 1,000 pounds and in a collision with an automobile "most of their mass is at the windshield level of a car."